The Lakers will face Searsport in the semifinals thanks to a one-sided 69-24 win in their Western D quarterfinal. AUGUSTA — Rangeley had more experience playing at the Augusta Civic Center. The Lakers also had the incentive to make sure it wasn’t a close game again. They have outside shooters and they have two 6-footers. All of those advantages were too much for Valley to overcome on Monday morning. No. 2 Rangeley scored 32 straight points in the first half and rolled to a 69-24 victory in a Western D quarterfinal. Staff photo by Andy Molloy Rangeley Lakes Regional School's Seve Deery-Deraps dribbles past Valley High School's Michaela Marden during a basketball matchup Monday in Augusta. Staff photo by Andy Molloy Rangeley Lakes Regional School's Blayke Morin goes for a layup through Valley High School's defenders Kirsten Mathieu, right, and Haven Mayhew during a basketball matchup Monday in Augusta. Rangeley (18-1) moves on to face No. 3 Searsport in the semifinals at 10 a.m., Thursday. No. 6 Valley finishes at 9-11. Seve Deery-Deraps had a game-high 21 points and Taylor Esty added 16 for the Lakers. Teagan Laweryson scored 16 for Valley. 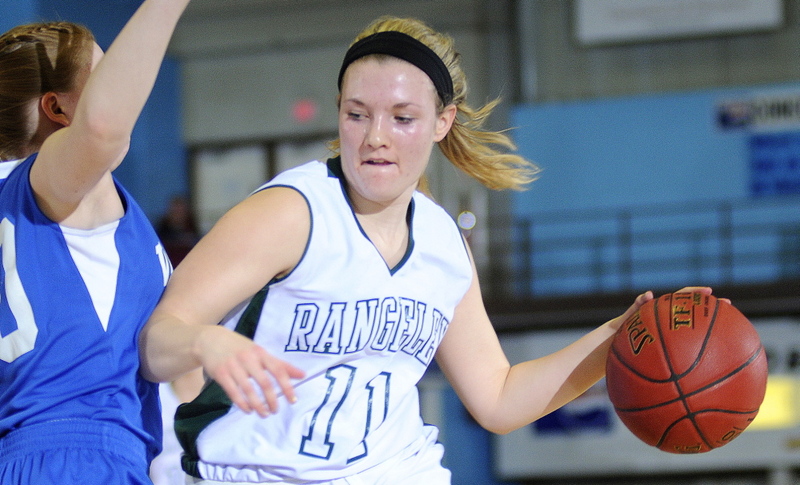 Rangeley defeated the Cavaliers by scores of 48-29 and 53-43 during the regular season. The second meeting was actually much closer, as the Lakers had to rally from behind in the second half. Valley led 2-0 after a basket by Kirsten Mathieu, but Rangeley responded by scoring the next 32 points and led 37-4 at halftime. Deery-Deraps scored 13 points in the second quarter alone, and Esty, Egan (eight points), and Tori Letarte (10) also chipped in. Valley shot 1 for 19 in the first half. The Lakers rarely allowed Valley to get good shots in the first half, and when they did, the shots went halfway down and kicked out. With the score 25-2 midway through the second quarter, Deery-Deraps drove from the top of the key, made a layup and drew the foul. She missed the free throw, but grabbed the rebound and drew another foul, then made both foul shots. The next time down the floor, Deery-Deraps dropped down a three and it was 32-2. Esty, a 6-foot-1 junior, made two 3-pointers in the game in addition to her inside play. Laweryson had a strong third quarter for Valley with 12 points. She, Mathieu and Meaghan Hunnewell are the only seniors on the Valley roster. 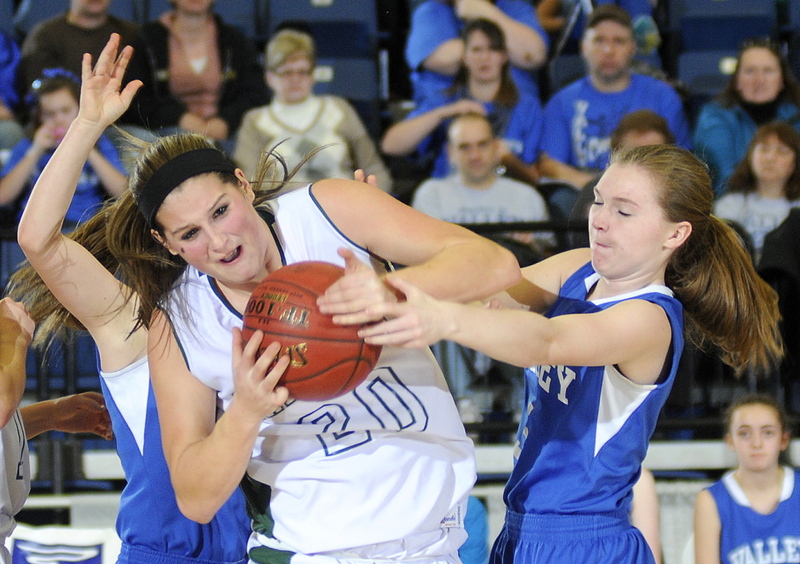 Rangeley and Searsport did not meet during the regular season. Searsport pressed and fast-breaked its way to a 73-53 victory over Richmond on Monday.